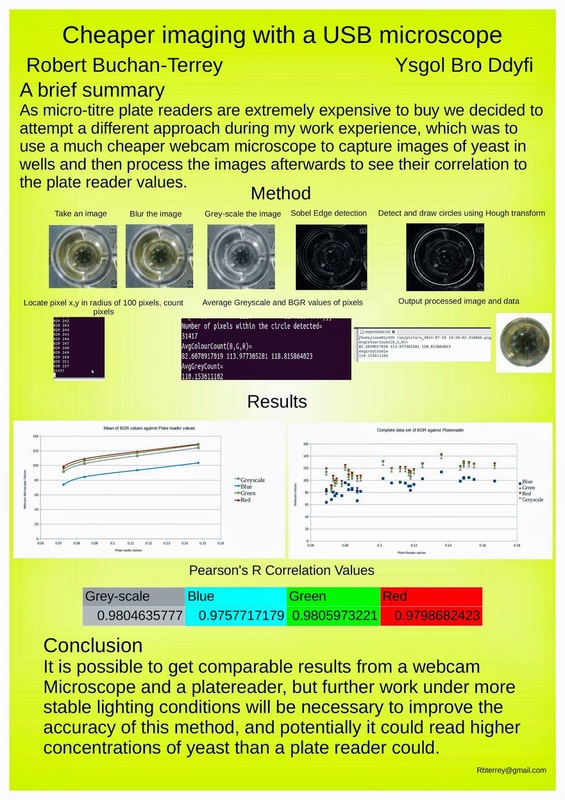 An A-level student has just spent two weeks with us for his work experience, and his project has been to investigate the use of a cheap microscope webcam as an alternative to an expensive plate reader for the measurement of the growth of yeast in microtitre plates. The longer term aim would be to mount this webcam on the deck of our Tecan Genesis liquid handler robot, and to have the robot arm move the plate under the webcam. The webcam is a Veho VMS-004, used at 20x magnification, and it costs just £40. It was recognised automatically by Linux as a webcam and worked really well with the OpenCV library. He also produced a poster to demonstrate the findings and to take back to his school. And the answer is: although he's just analysed the data from one time point so far, and we took no care to make sure the lighting conditions were stable when taking the images, or to shake the plates to evenly disperse the yeast, it really does look very plausible that we could use this in future. Averaging over 8 replicate wells gives a remarkable correspondence between image-analysis results and plate reader results. Individual wells are more variable, but still show promise. We've yet to test all the data, and to test the full range of the scale of optical density, but this looks extremely exciting. Thanks very much to Wayne Aubrey and Hannah Dee for their help and expertise with the yeast biology and the image processing respectively.